Students of Resonance Commerce & Law Program Division (CLPD) Kota, Jaipur & Indore Centres performed exceptionally well in CA-CPT (Dec-2017) & CA-Final (Nov-2017) results, declared by the Institute of Chartered Accountant of India (ICAI) on 17th January, 2018 at 6:00 p.m. In CA-FINAL (Nov-2017) Result, Resonance CLPD students MOHIT CHAUHAN Secured AIR-26. Total 32 Students got selected in the Exam. Total 4 Students MOHIT CHAUHAN, ANURAG JAIN, POOJA BABBAR & TARUN GWALANI cleared Both Groups. 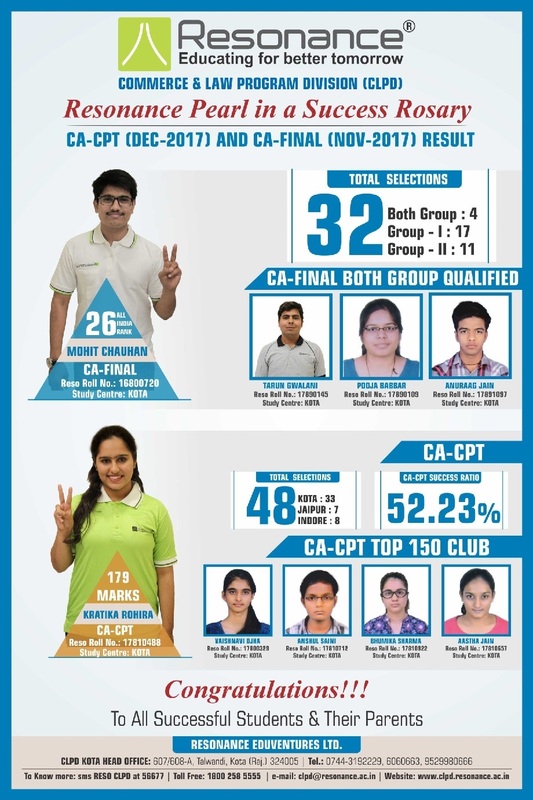 In CA-CPT (Dec-2017), Total 48 Students from Resonance CLPD got selected in the exam, of which 33 students were from Kota Study Centre, 7 students were from Jaipur Centre and 8 students were from Indore Centre. KRATIKA ROHIRA topped Resonance with 179 Marks out of 200. Managing Director of Resonance, R.K.Verma congratulated all the RESOnites on their success and wish them Luck for their future Endeavours.